Snapchat is adding a Google to their app, hold on. 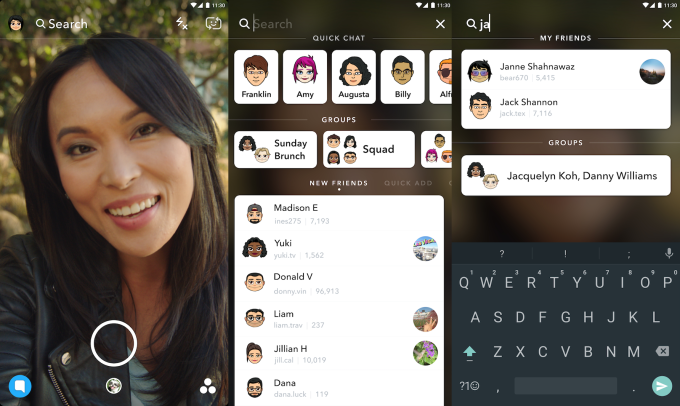 It is only for all things Snapchat, such as finding friends, Stories, and Discover, all of which will now be accessible from a navigation bar at the top of the screen. It has not been made available to everyone just yet, but it is coming soon so you can look forward to giving the new feature a test run. For now, Snapchat has entrusted a few of their Android users with the new update. iOS and other Android users will have to be patient for now. Being slightly more user friendly is the target we are guessing. You may or may not have seen the tweet, where a woman tells a club bouncer she does not know how to use Snapchat, and he lets her in. It may be a joke, but she does have a point! Didn’t have my ID card at the club, so just showed the bouncer that I didn’t know how to use Snapchat, and he let me in. Snapchat has thrived on and was specifically designed to attract young users but there are only so many of them in the world with top of the line smartphones and impeccable internet reception, sharing their daily shenanigans and watching other’s indulge in their own version. Using Snapchat is a harrowing experience for anyone above 35 years of age, mainly due to the app interface and navigation being considered challenging, due to which Snapchat added navigation buttons last year. It helped, but Snapchat being all about ephemerality, the content has no shelf life, and only the Daily Active Users matter. Snapchat users can only eke out so much fun from the repetitive Stories of their friends, of their pets and their meals, from the Discover channels and if they follow celebrities, who in stark contrast to our slightly to very mundane lives, lead vibrant ones. Now maintaining the balance between privacy and fresh content has been a persistent stumbling block for Snapchat which has prevented a lot of users from coming back once they have had enough of the said repetitive stories. 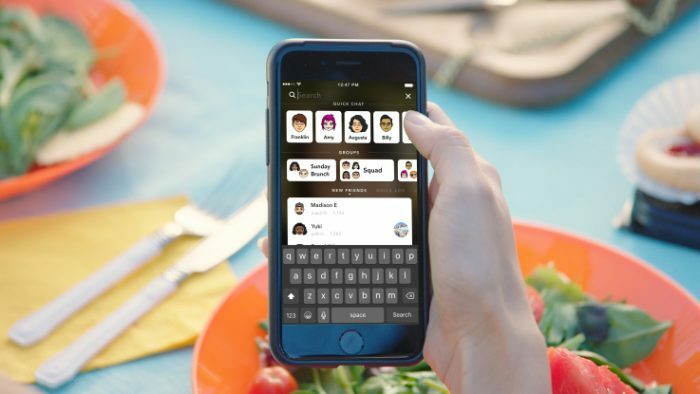 The new search button, courtesy to Snapchat’s August acquisition Vurb, a mobile search app, is aimed at simplifying the process of finding and adding new users to keep interest high and keep them coming back. 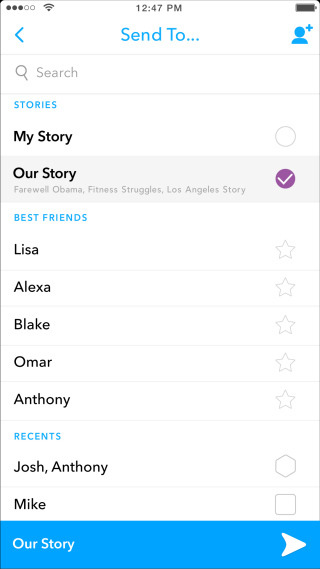 As shown above, you can type and locate Stories or messaging threads with your friends, or look for new accounts by searching for them right within the Snapchat interface. Convenience is the primary focus, so if you are in a hurry or quite simply lazy or new to Snapchat and don’t know where to click or swipe, Search bar to the rescue. Another interesting new introduction is user generated and submitted content, Our Story, wherein you can send your Story to Snapchat, which they can curate and broadcast to a wider audience. It allows Snapchat to find content from events or to create a theme, maybe an Adele concert for that matter, or Halloween, which adds a personal touch, and numerous Stories in one place. Competition may have forced this new innovation, with Instagram Stories just hitting 150 million DAU, yes that is the same number as Snapchat. The success of Instagram Stories can be attributed to their vast user numbers, but it does not end there. 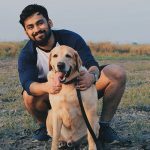 Instagram is flushed with accounts and finding new content for veteran Instagram users is a piece of cake! This new update may not fully level the playing field, but it may improve Snapchat’s odds just a little bit.